"I will be retiring for personal reasons at the end of March. I feel very fortunate to have worked with some amazing colleagues over the years, and really appreciate all the support that our staff here have given me and our patients. I will miss so many of our patients here who have become so much part of my life over the past 33 years. We have shared good and less good times together and I really hope that all goes well with you all for the future. I am confident I am leaving you in good hands!" New Court Surgery are proud to have again been awarded the Gold Plus Award by Wiltshire Investors in Carers in recognition of the outstanding services and support provided to carers by the surgery. New Court Surgery are also proud to have been awarded the GP Practice Placement of the Year Award by Oxford Brookes University for being outstanding training placement partners. 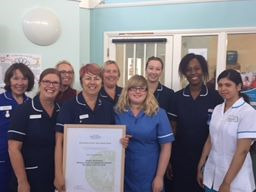 Well done to our excellent nursing team! Please click on the link below to view details on Wiltshire "Your Care, Your Support". This website has been developed by Wiltshire Council and Healthwatch Wiltshire to provide people with information about care and support services in Wiltshire and to provide information about what services are available within your community. We are keen to appoint a GP for New Court Surgery – a friendly and supportive training practice providing services to 10,000 patients - see here for more details.